Polypropylene straps. Adjustable velcro closures on straps. Rubberized EVA antimicrobial footbed. EVA midsole. Vulcanized A.R.T2 rubber outsole. Made in Israel. 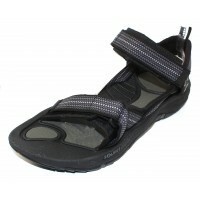 Each pair comes with an Eco Logic Carry Bag for easy packing even when your sandals are wet or dirty. Polypropylene straps. Adjustable velcro closures on straps. Rubberized EVA antimicrobial footbed. ..